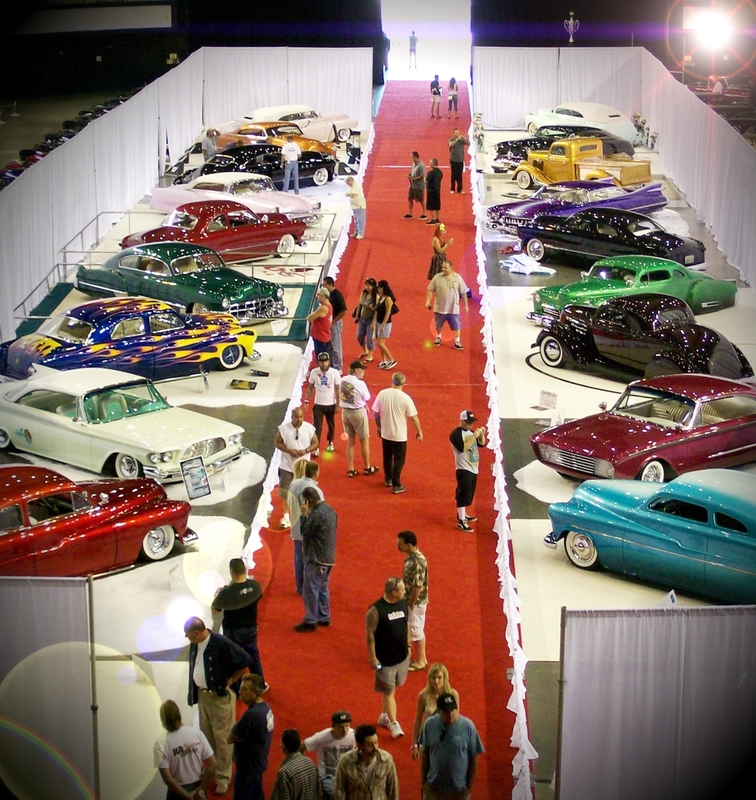 If you’re into customs, then the Long Beach Motorama is not to be missed! 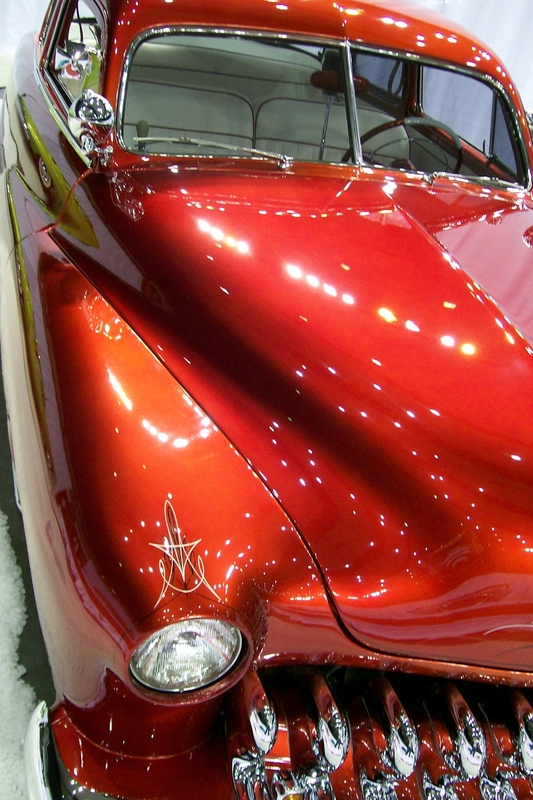 Although there are plenty of beautiful cars (like the ones I featured in my Motorama – First Look article) the highlight of the show is the Kustom D’Elegance award. Each of the dozen-plus contenders impressed in their own way… just being in the room sets these cars apart from the pack. 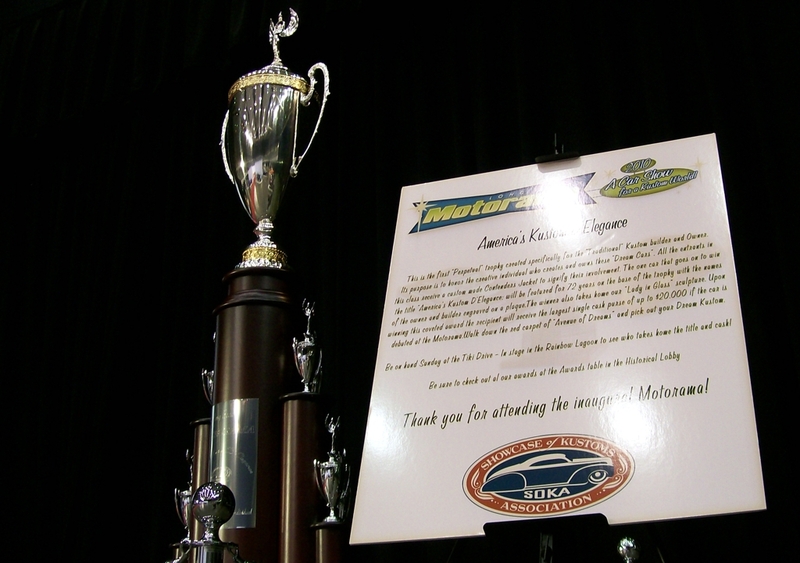 However, just one could win the $20,000 cash prize along with a place on the perpetual trophy! This roof- hammered 1959 Cadillac came all the way from Australia and was, I’m sure, one of the most customized cars present. Gene Winfield’s old 1935 Ford Pickup shop truck , which had disappeared in 1965, was found in 2008 and resurrected to beautiful completion by Hatfield Restorations. 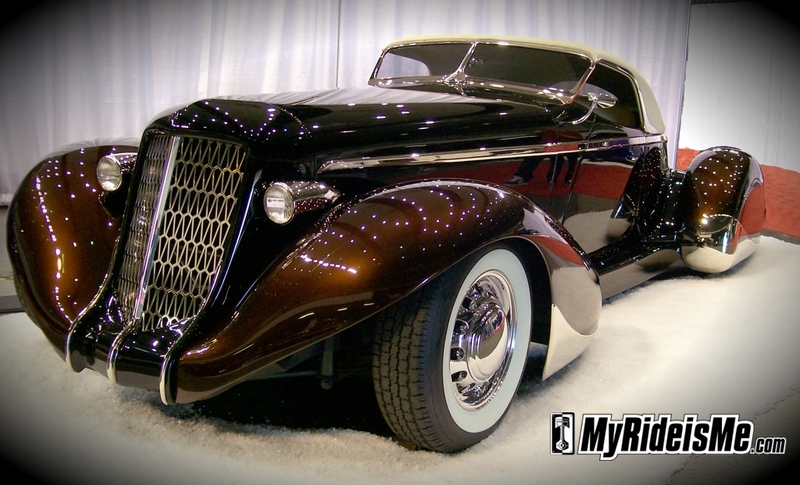 This 1936 Auburn Roadster had some nice appeal. 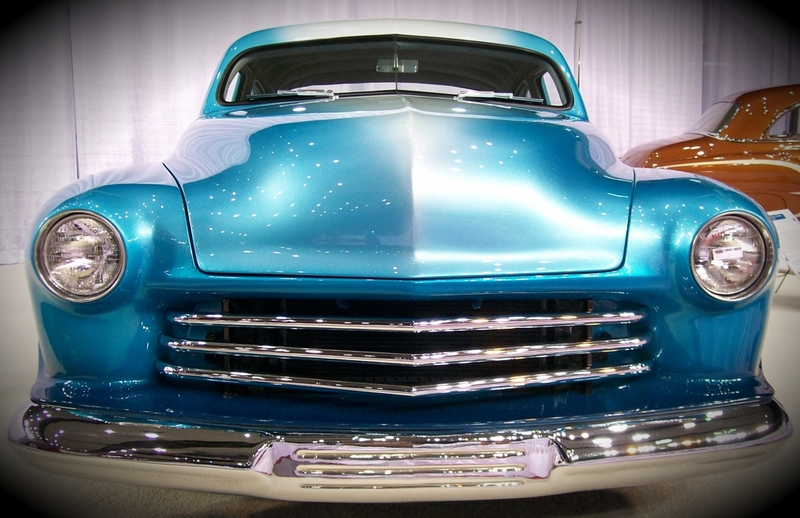 Voodoo Larry’s newly completed 1946 Ford was in the running also. Those of you who don’t know him- although he’s from Chicago, he shows up in SoCal often! Another car of his won best of show at Ink and Iron in 2009. This pink wonder came out of John D’Agostino’s shop. Make sure to check out D’Agostino’s 1959 Cadillac Biarritz. 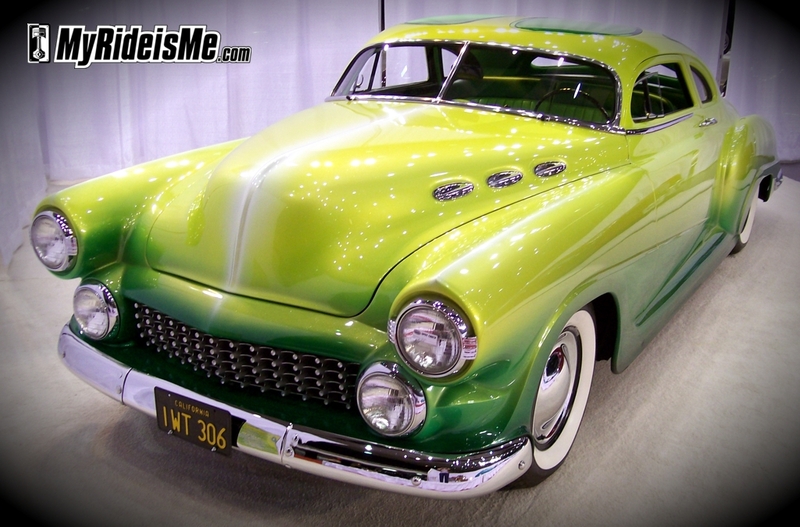 This 1951 Mercury had an equally eye-catching color… painted by Gene Winfield, of course. Pretty in scallops is this 1951 Chevy Coupe. Another 1951 Mercury is this ruby. You should see the lime color on this 1950 Chevy Coupe – the lime plastic inserts in the roof shine lime-colored light into the cab too! 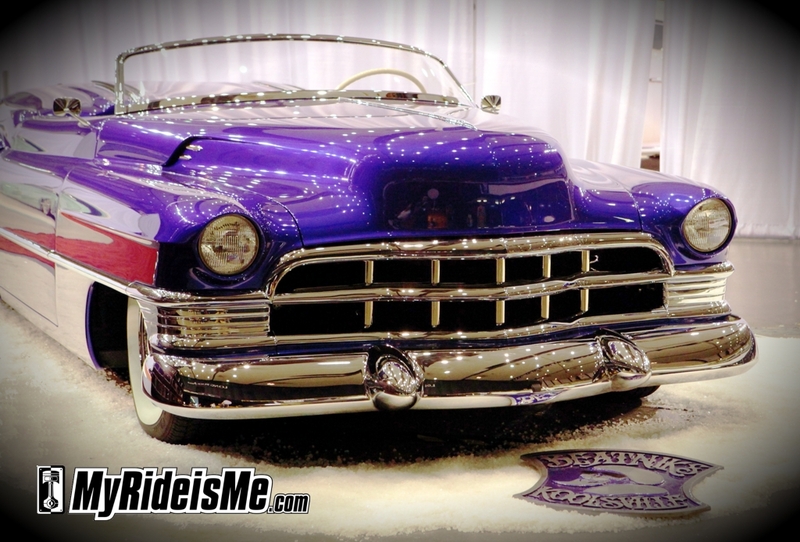 This 1950 Cadillac Roadster came out of Rick Dore Kustoms and was a beauty to look at… if only I could’ve taken her out for the nightly cruise at the Motorama! Which one do you like best? If you missed the show, there’s always next year… keep tabs over at the Long Beach Motorama website. Think this year’s car shows are finished??? Think again! 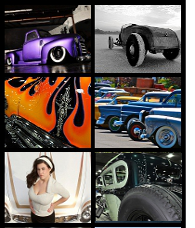 GreaseGirl will be at The Bedlam Ball down in San Pedro this weekend, along with her car club The Gasoline Girls. Then at the end of the month is Gene Winfield’s custom show out in Mojave, CA. And don’t forget the Hot Rod Reunion at Famoso! Do they ever take these car to the streets? I can’t believe that no one has photographed the radical 50 Olds that was chopped etc. That was the most beautiful car in the place. No one has mentioned it on any of the coverage I have seen yet.I don’t get it. Nevvvverrr mind………Just found it, I guess I wasn’t expecting it to be that one, oh well…………..